Hey guys. I have one of those traditional questions - how to fix the last name during ROC. 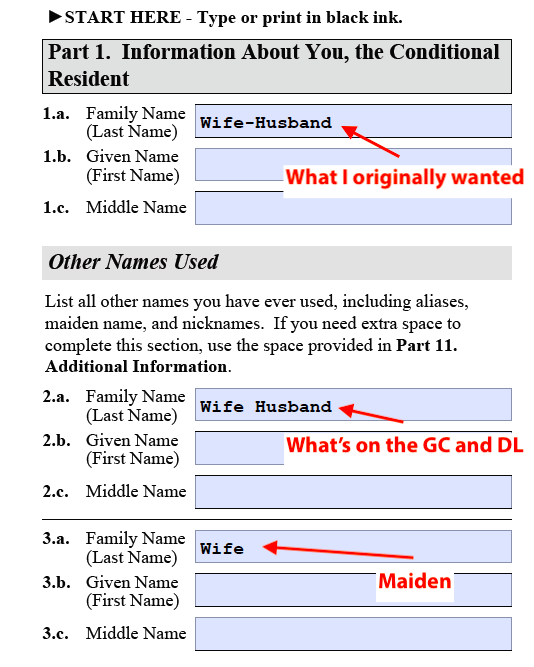 TL;DR - USCIS dropped a hyphen from my married name on my conditional GC, said it's best to fix it during ROC, and I just want to make sure I understand what name goes where on I-751. After getting married, I added my husband's name to my last name, with a hyphen. So if my maiden name is Wife, and his last name is Husband, I went for Wife-Husband. I then updated alllll my stuff to show that name, and a few months later we applies for AOS. USCIS were pretty good until the interview invitation. I hadn't noticed it at the time, but they suddenly wrote my last name on it as Wife Husband. I noticed that only after getting the card in mail. Had an infopass appointment, and they said "just do it during ROC, it will be quicker". So I kept the hyphenated name on all my accounts. Even my EAD card (which I still have - is that bad?) has my last name the way I intended. the maiden Wife in field 3a? 08-30-2017 9 hours after getting out of the interview received email "we ordered your new card". 08-31-2017 33 hours after getting out of the interview received texts about case updates (i.e. texts were received 24 hours after emails). 08-31-2017 Hard copies of i-130 and i-485 approval notices received. 09-05-2017 "Card mailed" update on USCIS web site with notifications via text and email. Nothing on my USPS dashboard. 09-06-2017 Tracking number posted to USPS dashboard with "pre-shipment info sent". 09-08-2017 Green Card in hand. 09-11-2017 Online Request to fix the typo in the last name on the Green Card submitted. 09-20-2017 Infopass appointment. Result: "It's easier to wait for ROC and make sure they spell you name correctly at that time." 09-25-2017 Email received in response to the online request: "Infopass is the way to do this". Adding a hyphen is a very minor change to make but you are most definitely entitled to make such a change. Its your name and it should be the way you want it. What you posted above is all the correct way to do it IMO BUT I really urge you to include a letter explaining how you want this hyphen and how it was not processed with a hyphen on the original GC, and you want them to make sure they include a hyphen this time so there is one on the new GC issued- which you can then use to update your others IDs. I worry that if you just fill it out with the hyphen and no letter it will be overlooked because it is such a minor change. USCIS may not notice you added a hyphen and process your ROC with out one. Ah, great point about including that explanation. Thanks!